Desert Hills 5 in Green Valley is a 55+ community of single-family and attached homes in Pima County, Arizona. Homeowners enjoy access to all of Green Valley Recreation s amenity-filled facilities as well as a vibrant social scene throughout an area designated for active adults. Not only do homeowners of Desert Hills 5 enjoy a tight-knit sense of community where neighbors become lifelong friends, they also have the convenience of living in the Southern Arizona area with a year-round warm climate. Homeowners pay a reasonable fee that provides access to the 13 recreation centers that make up Green Valley Recreation (GVR). GVR s facilities are spread throughout the Green Valley area and are available to active adult residents. Its world-class amenities include meeting rooms, hobby studios, fitness centers, and ballrooms. The year-round warm climate makes it easy to enjoy the many outdoor facilities as well. There are numerous sports courts, parks, fishing lakes, trails, and picnic areas. 55+ homebuyers will be pleased to know that one of the 13 centers is located near their subdivision. Desert Hills Social Center includes a clubhouse, auditorium, meeting rooms, and an exercise room. Exploring new hobbies is a breeze with an arts and crafts studio, ceramics studio, and lapidary studio included as well. Outdoors, Desert Hills 5 residents can walk to a swimming pool and spa, four tennis courts, and shuffleboard courts. Desert Hills 5 is an all resale community that consists of 195 homes built in the early to late 1980s. Homebuyers can find an attached or single-family home that suits their needs. Both attached and single-family homes were built with two bedrooms, two bathrooms, and an attached two-car garage. Most residences offer between 1,300 to just over 2,000 square feet of living space. Homes throughout Desert Hills 5 enjoy picturesque views of the Santa Rita Mountains and traditional desert-style landscaping. Homeowners throughout Desert Hills 5 enjoy a variety of clubs, sports, games, and special interest activities hosted throughout the many GVR facilities. Those interested in card games can partake in bridge, canasta, hearts, poker, and euchre. Special interest groups can help form new hobbies by offering clubs that focus on woodworking, ceramics, quilting, or lapidary. With activities like hiking, swing dancing, tennis, bocce ball, billiards, and more, there s always something for those who are more physically focused. With over 60 clubs and activities offered by GVR, residents are always sure to find something to keep their calendars full while living in Desert Hills 5. Desert Hills 5 is located in Green Valley, Arizona. This 55+ community in Pima County is situated in Southern Arizona just west of Interstate 19. It is located about 20 miles south of Tucson and 35 miles north of Nogales, Mexico. Residents enjoy living in a picturesque area just west of the Santa Cruz River with mountain views as well as views of the Coronado National Forest. 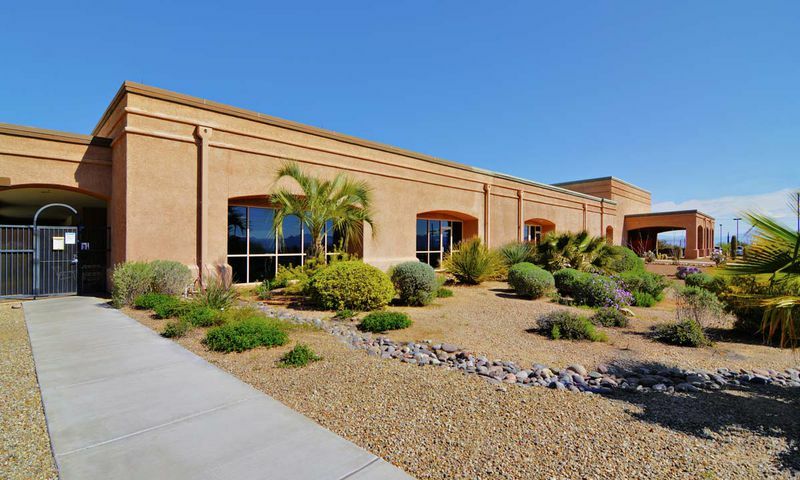 Both retail and professional services are situated just two miles away along Continental Road. When looking for a 55+ community in Southern Arizona that s located in an area of active adults and great amenities, look no further than Desert Hills 5 in Green Valley. There are plenty of activities available in Desert Hills 5. Here is a sample of some of the clubs, activities and classes offered here. Most residences offer between 1,300 to just over 2,000 square feet of living space with two bedrooms and two bathrooms. Homes throughout Desert Hills 5 enjoy picturesque views of the Santa Rita Mountains and traditional desert-style landscaping. Please Note: Floor plans are not available at this time. Both attached and single-family homes were built with two bedrooms, two bathrooms, and an attached garage. Most residences offer between 1,300 to just over 2,000 square feet of living space. Please Note: Floor plans are not available at this time. 55places.com is not affiliated with the developer(s) or homeowners association of Desert Hills 5. The information you submit is distributed to a 55places.com Partner Agent, who is a licensed real estate agent. The information regarding Desert Hills 5 has not been verified or approved by the developer or homeowners association. Please verify all information prior to purchasing. 55places.com is not responsible for any errors regarding the information displayed on this website.